So I walked into a store yesterday and was shocked to see all sorts of pink and red, everywhere! Heart shaped candy. And mugs. Spatulas with tiny cupids start taking over the store. I think its safe to say; the holiday cheer has slowly disappeared. This sense of being caught in limbo has kicked in. I mean, what is there to look forward to once January comes around? I guess shop keepers are feeling the same way. Putting out the stuff for the next holiday in hopes to cheer people up.I just have one bone to pick with them. Can a girl get a break between New Years and Valentines? 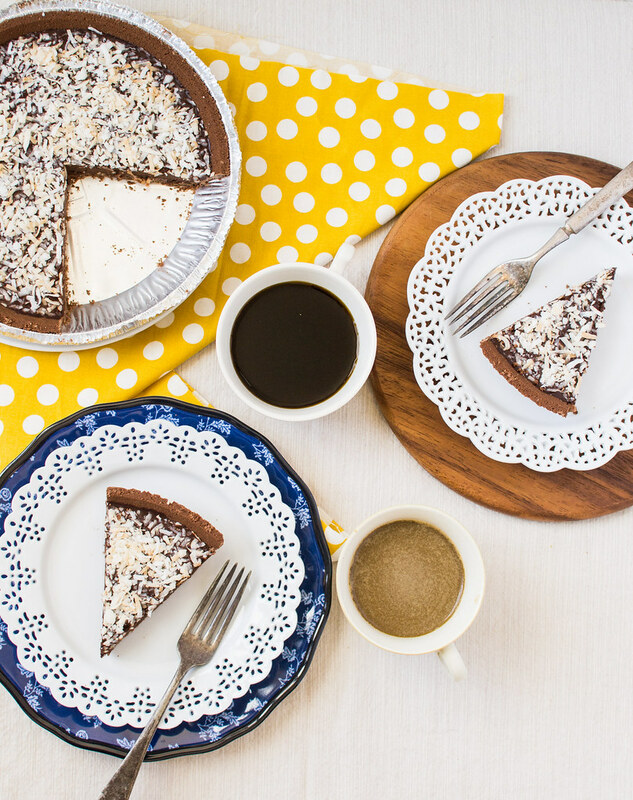 Maybe a chocolate ganache pie to just chill out with in between. I mean here I am just now putting away the confetti. Downing the last of my snowman sugar cookies. And before I can even vacuum the crumbs, all sorts of pink measuring cups and heart shaped aprons find their way out of the back room and onto to the shelves of my favorite stores! How about a month of R & R? You know, letting the stress of the holiday season wear off before throwing us headfirst, again? I say we rebel. Make some pie. Take it easy. Just for a little bit. Side note: Hubby opted for this chocolate ganache pie for his birthday this year when asked for what kind of cake he wanted! Yup, its that good! This is gonna go by real fast. No baking. No big appliances to wash. Just quick and easy pie. The best kind there is. 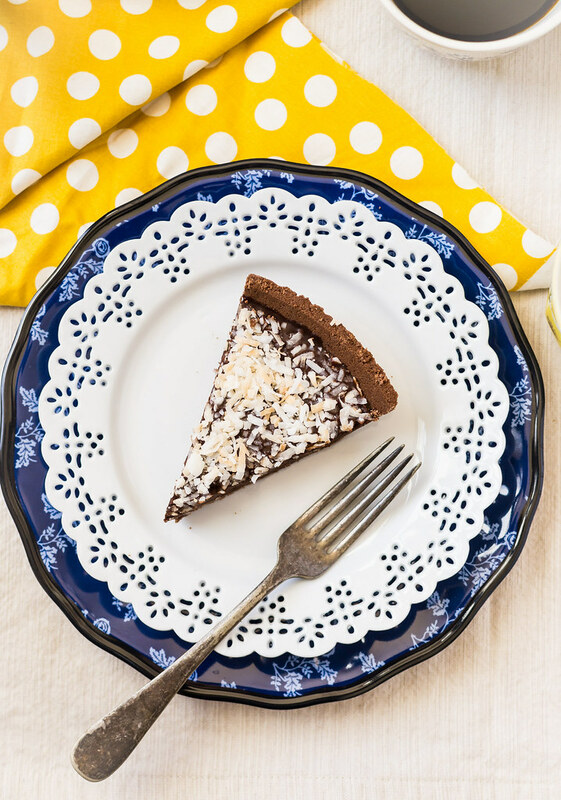 A quick 20 minute chocolate ganache pie that’s just perfect for the chocolate lover in your life. 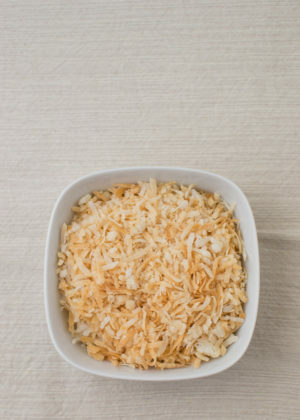 In the bottom of a pre-made pie crust, spread half of the toasted coconut flakes, reserve the other half for later use. 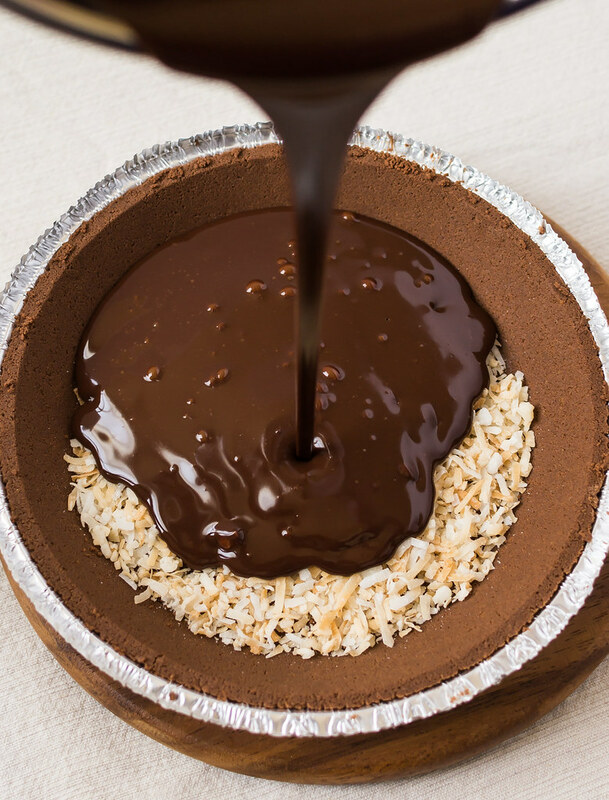 On a double broiler, heat the chocolate, heavy whipping cream, vanilla extract, and espresso powder until smooth. 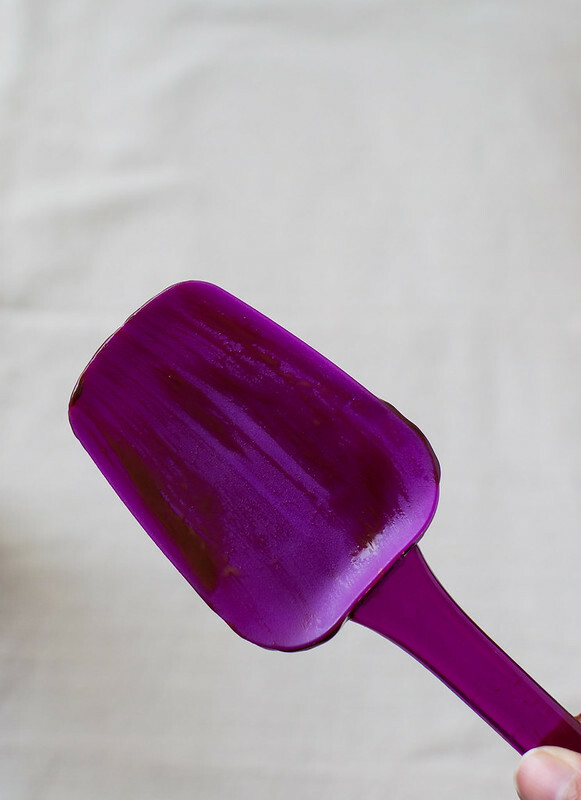 Remove from heat, stir for 5 minutes until cooled. 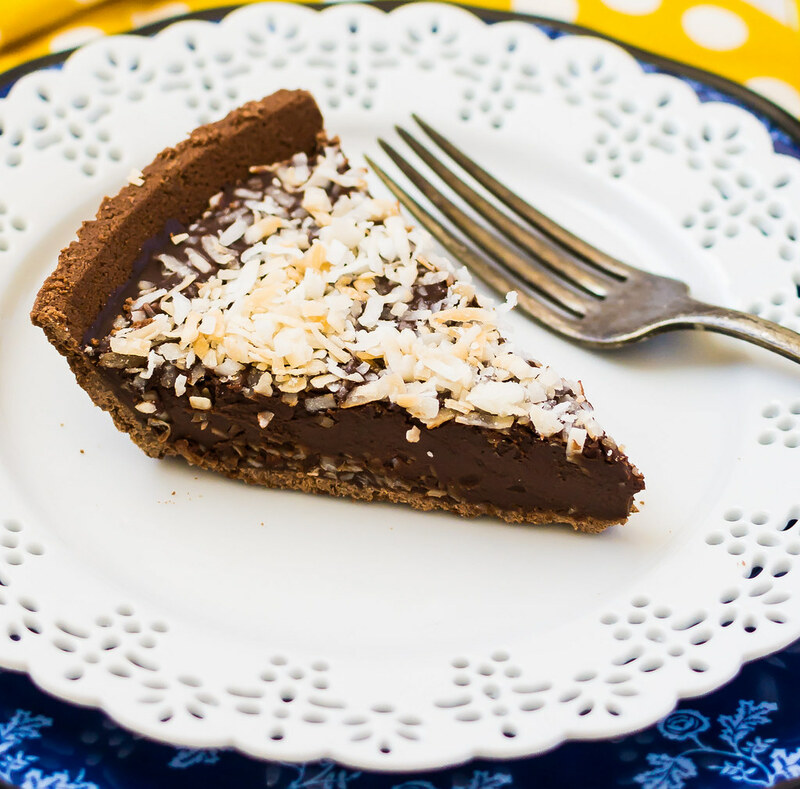 Pour the chocolate mixture onto the pie crust lined with toasted coconut. 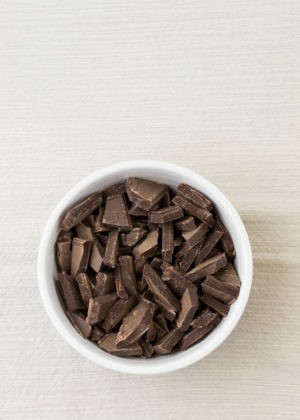 Sprinkle the remaining coconut flakes over the chocolate mixture. Cool in refrigerator for 2-3 hours or until completely set. If you can’t find toasted coconut at your local grocery store, you can toast it yourself. 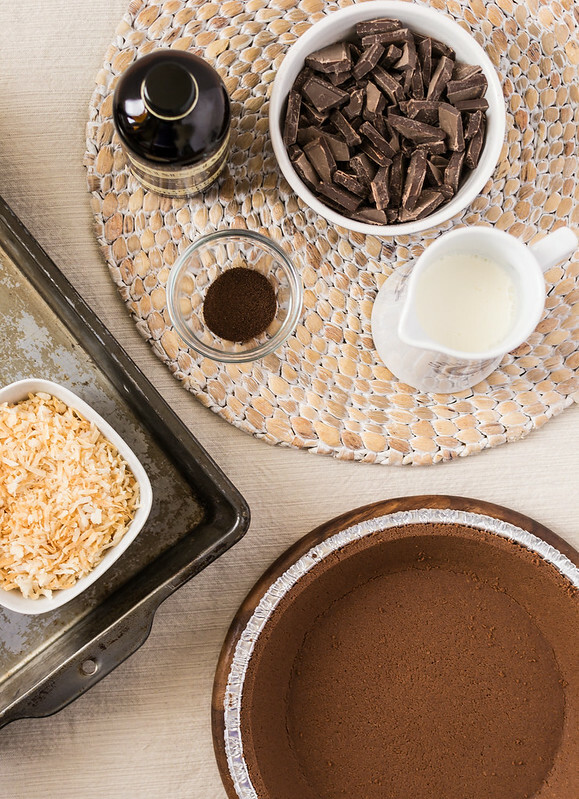 Preheat an oven to 350 degrees F. Spread sweetened coconut flakes on a baking sheet in a single layer. Bake for 5 – 6 minutes or until they slightly toast and crisp up.